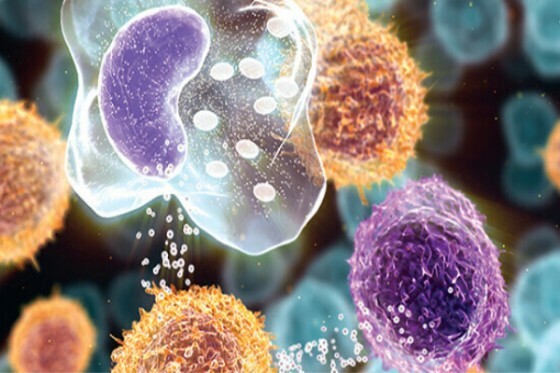 Cytokines, also known as growth factors, are tiny cell-signalling protein molecules secreted by various cells and utilized widely in intercellular communication. They may be classified as peptides, proteins, or glycoproteins and you might think of them a bit like the body's mobile phone system. Proper cytokine cell signaling can make the difference between success and failure of treatments, given that imbalance in the body is responsible for most disease processes. We have been using cytokines with stem cell and PRP treatments for some time now and believe their use has caused a quantum leap in efficacy of the treatments we offer. The term, "cytokine", derives from the Greek cyto (cell) and kinos (movement) and is a technical term for "growth factor". Cytokines are typically secreted at the site of repair by many different cell types including platelets, stem cells and fibroblasts. These growth factors bind to the cell membrane and start the cascade of DNA synthesis, mitosis and cell repair. Some of these growth factors have a very positive effect on the stem cell environment, sometimes called the "stem cell niche". Paracrine action, where they affect neighboring cells. Autocrine action, where they affect the surrounding cells [also called the extracellular matrix]. Noting that stem cells work in a very similar fashion, one could think of cytokines as the architects of cell repair, but with the caveat, not all cytokines are good. If you have symptomatic osteoarthritis, the chances are that your symptoms are being caused by bad cytokines. Two examples are Interleukin 1 (IL-1) and Interleukin 6 (IL-6). These bad cytokines cause pain, swelling, and typically cell death. When you are causing cell death you are in what is called a catabolic state. This means you are breaking down tissue, causing destruction of the cells and eventually failure of the system. Another important bad cytokine is called Tissue Necrosis Factor or TNF. TNF will block repair and cause cell death. In Regenerative Stem Cell Therapy, we are trying to counteract these bad cytokines by manipulating good cytokines that come from both stem cell and PRP injections. Our aim is to turn the tide and get the joint or tendon into an anabolic state. An anabolic state means we are now building up tissue. Three very important good cytokines are Interleukin-1-Antagonist (AIL-1 or IL-1A), Interleukin 10 (IL-10), and insulin-like growth factor-1 (IGF-1). These can override the catabolic action of bad cytokines. What these growth factors actually do is try to modulate or diminish the inflammatory response. We now know this is one of the most important jobs of mesenchymal stem cells. If a significant inflammatory response is present, then repair is jeopardized. Note that the reduction of inflammation is more at a cellular level and thus non-steroidal anti-inflammatories will not achieve this goal. The immunosuppressive cytokines, TGF-beta and Interleukin 10(IL-10), have also been implicated in regulatory T-cell function [see TREGs under MSCs]. In addition to modulating inflammation, good cytokines actually help repair the tissue. There are many varieties of these good cytokines and the following lists just a few examples. (TGF) is important in collagen synthesis and tissue repair. This is a major repair growth factor. TGF appears to stimulate macrophages (a form of white blood cell) to secrete various growth factors. It also directs the macrophages and other cells to areas needing repair. Finally, it stimulates the formation of blood vessels (angiogenesis). (FGF) helps organize connective tissue. FGF's functions are similar to TGF but it seems more involved with stimulation of the growth of new blood vessels. (IGF-1) is the active form of Human Growth Hormone and, amongst other things, is very important in cell division. In fact, it is so important that we are giving it as an injection into an affected joint or tendon. IGF-1 is found in PRP and stem cells. It is secreted by the liver through stimulation of the growth hormone. Studies show that IGF-1 stimulates the glucose uptake by cells, thus supplying them with more energy. It inhibits protein catabolism (destruction) and is also believed to affects cell receptors that drive a stem cell toward the formation of cartilage tissue. Finally, it seems to block many of the interleukin inflammatory pathways. (VEGF) is important in that it helps to establish a blood supply where typically there is no blood supply. This is a very important concept in stem cell science. Cytokine therapy is one the new exciting fields in medicine which, like stem cells, has the ability to dramatically change the face of medicine and treatment protocols designed to conquer a variety of conditions. Indeed, it is possible that, someday, just using these cytokines will eliminate the need for harvesting stem cells in some treatments. Cytokines are the building blocks of life. When we master cytokine therapy we will significantly reduce the debilitating effects of most diseases. Of course, there has to be a delivery mechanism to get the cytokines to where they are needed in the body. For this, exosomes are used and we have a proprietary method of obtaining exosomes from plasma. Clearly, the most effective treatments need to reach beyond just stem cells. There are numerous component parts, all of which need to come together in the right way at the right time if we are to deliver an optimal result. Our Cayman facility is fortunate in that it is one of two clinics in the world that has access to a variety of growth factors specifically designed for certain medical conditions. This is due to Dr. Purita's relationship with one of the world's experts in growth factor therapy. As part of consultation, we shall determine the cytokine treatment best suited to your condition.